After nearly a year of fundraising, I recently participated in Dance Marathon at FSU 2018! You may have seen my post from Dance Marathon (or DM) last year or heard of DM from your own school or someone you know. It’s nearly impossible to get a clear picture of the total when everyone was so excited!! “For the kids” (or FTK) is the unofficial slogan that accompanies Dance Marathon, since the event fundraises for Children’s Miracle Network, Shands Children’s Hospital. At FSU, a portion of the money goes to FSU’s College of Medicine Pediatric Outreach Program. The event is slightly different at different schools, depending on the size, but the premise is the same. Dance Marathon at FSU takes over a whole weekend. Spanning 40 hours in total, dancers stand and dance (no sitting down!!) for 20 hour shifts to raise awareness, keep fundraising, and ‘stand for those who can’t’. Dance Marathon is a big deal for us Seminoles, and it’s always a great experience to see everyone rally behind one cause throughout the year, and then literally stand together for 40 hours. When I first heard of “DM” and “FTK” my freshman year of college, I knew I wanted to get involved. Last year, I just hoped to raise the $300 required to dance at the event. But with this year possibly being my last marathon since I’ll be graduating this December, I challenged myself to Do More. I’m not sure how much I’ll get to participate in Dance Marathon next year as an alumna, so I wanted to make this year count. 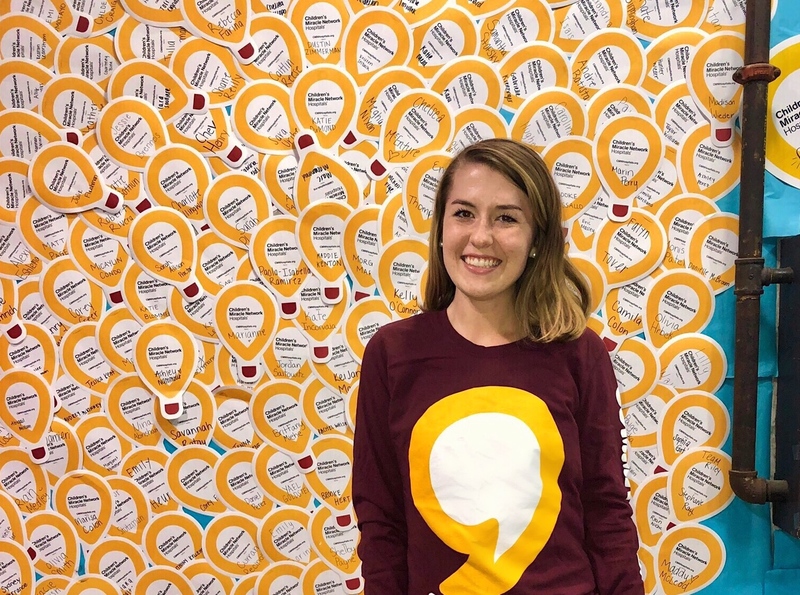 I set a personal goal of raising $1,000 by the marathon, to join the coveted “Comma Club”, and I’m proud to say I passed my goal! By the end of the marathon, I’d raised $1,200 for the kids! I also had the opportunity to tour Shands Children’s Hospital in Gainesville, FL with some of my fellow fundraisers. We get to hear lots of ‘miracle stories’ from families whose children are surviving and thriving from whatever their pediatric illness may have been, but visiting the hospital where all the miracles take place made it all so real. As we walked the halls of the hospital, the tour staff pointed out the Children’s Miracle Network logo (the yellow balloon) on various equipment, which meant CMN funds paid for that item. Maybe it’s just money, and maybe we’ll never be able to do enough, but it’s humbling to get to play even a small role in such an effort. The extra funds from DM means that life for the kids and families that enter Shands might be just a little easier, and that makes it worth it. Read more about DM at FSU here. And another huge thank you to everyone that supported me in this event and made this all possible! I go to Penn State and THON is something that I look forward to every year! FTK always!